5.1 How to install the plug-in ? 5.2 How to use the plug-in ? 5.3 How to report a bug/ask for an enhancement ? Eclipse is an extensible framework to build modular applications, which relies on OSGi component architecture. Originally developed to provide an IDE extensible in terms of functionalities and supported languages with plugins, Eclipse can now be used as a Rich Client Platform (RCP). The success of the Java Development Toolkit (JDT) plugin has lead to the development of numerous plugins. For instance the C/C++ Development Toolkit (CDT) plugin allows developers to use it as IDE for project in C or C++ language. The use of Eclipse as a generic IDE is possible due to the notion of perspective (a perspective corresponds to a certain disposition of the graphical elements) which adapts the user interface to the kind of project. Java Native Interface (JNI) is a programming interface to call native methods or to embed java virtual machine in native applications. JNI is often used to interact with existing native application, to add platform-specific functions, or to improve time-performance (by supposing native methods faster than java code). Currently, when users work on a java project using JNI and native code, they have to switch between perspective, which is not practical. Another point to improve is the debugging of this kind of project, by allowing developers to follow native method calls into native code and go back. see how to integrate in eclipse CDT ? How to use the plug-in ? You should have some java code which uses JNI and the native code associated. The plug-in should be installed. Set a breakpoint in the Java code after the code which loads the native library. 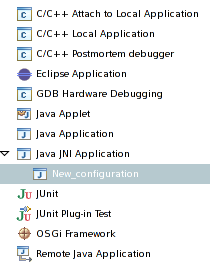 Open the debug dialog and create a new configuration of "Java JNI Application" kind. Set the correct settings for each tab. 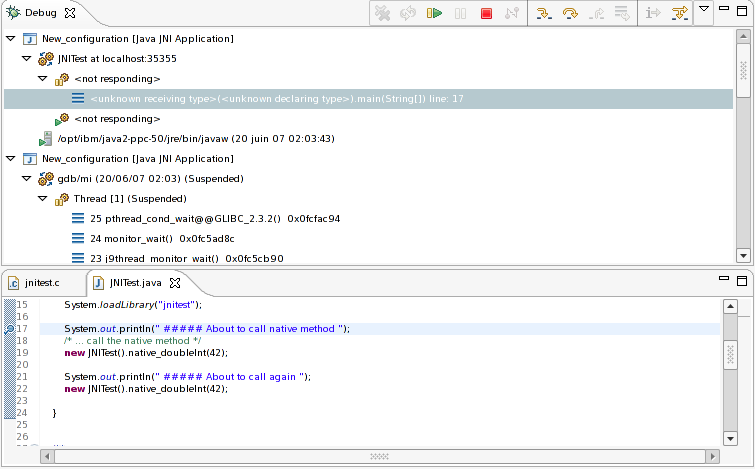 Set the C/C++ project and specify the javaw path as C/C++ application. Set the Java project and the main class. On linux machines you could have to add the current directory to the library path environment variable. The debug perspective will be launched with the 2 debuggers. Ready to debug ! How to report a bug/ask for an enhancement ? On the eclipse bugzilla there is a "org.eclipse.soc.jni" component for the "SOC" product in the "Technology" category. Please include the version of the plug-in and the maximum infos you can obtain. What is the supported eclipse version ? only eclipse 3.3 is supported for the moment. Is the project still maintained ? No, I have currently no time to maintain it. All code and documentation are available on svn, wiki and blog. Do not hesitate to contact me if you need further information. What is the current version of the plug-in ? What are the known bugs of the plug-in ? This page was last modified 10:43, 30 December 2008 by Mariot Chauvin. Based on work by Mariot Chauvin, Remy Chi Jian Suen and oge.